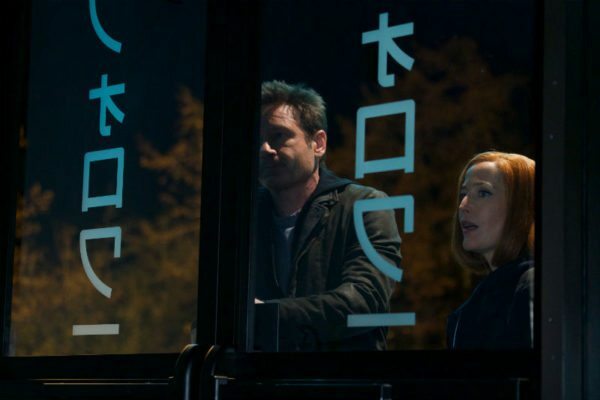 It’s date night for Mulder and Scully in this standalone episode of The X-Files swan-song series, one that attempts to do a Black Mirror with its humorous on-the-nose technological foreboding, but excels by taking an Inside No. 9 – A Quiet Night, dialogue light approach to the action. Beginning with an origin story, narrated in a compuspeak voice, we’re warned about the way we need to become better teachers to artificial intelligence, via the tale of a Twitter talkbot that evolves to take on all of the negative aspects of the online community, feed off them, and become a hateful, toxic presence. It’s prologue to a playful episode in which a trip to a sterile Sushi bar, with an over reliance on apps and online approval, leads to a wonderfully human final beat for our FBI Agents. The copy and paste title ‘Rm9sbG93ZXJz’ derives from Base64 code (I don’t know either), and translates as ‘followers’, something you wouldn’t expect our protagonists to have many of on social media. Maybe @CSM, @WalterSk1nner2, and @DoggettandReyesrule, but none of them would follow back. Essentially a two-hander for Duchovny and Anderson, the episode is a strange delight. The two exchange sparse dialogue as they navigate the sushi bar via the push of a button, or get lost in the contents of a shiny phone screen. 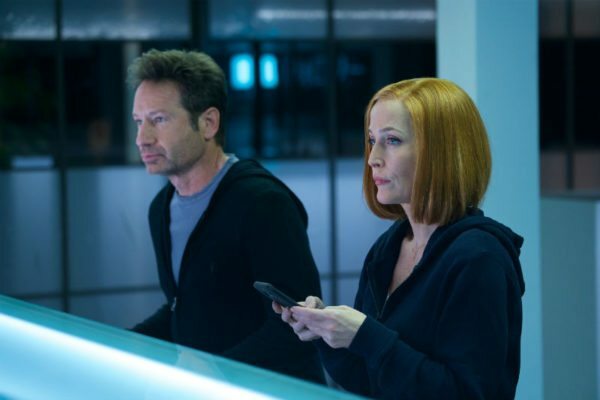 Their unsatisfactory date comes to an end, and due to a series of technological mishaps, Mulder and Scully leave separately, and the episode turns into the their own individual battles with bots. Scully must find her way home, despite being at the whim of a belligerent, voice activated, self-driving car called Whipz. Think the Johnny Cab from Total Recall, but with an LCD emoji, rather than a ventriloquist dummy as the driver. Things only get worse when she arrives home and her security system has gone a bit HAL. The exasperation of the situation gives Anderson the chance to flex her comedic chops again, and there’s great delight to be found in her password reveal, as well as the name of her brand of styling cream. Chances are, if you didn’t like episode 4 – The Lost Art of Forehead Sweat, then you probably won’t take to the brand of comedy on offer here. Duchovny gets a little less to do, and a little less in his pay packet if their respective homes are anything to go by. Fox highlights include him wrestling with the in-car music library as he attempts to get it to play a Prince track, and then taking a baseball bat to a possessed Batteries Not Included style drone. 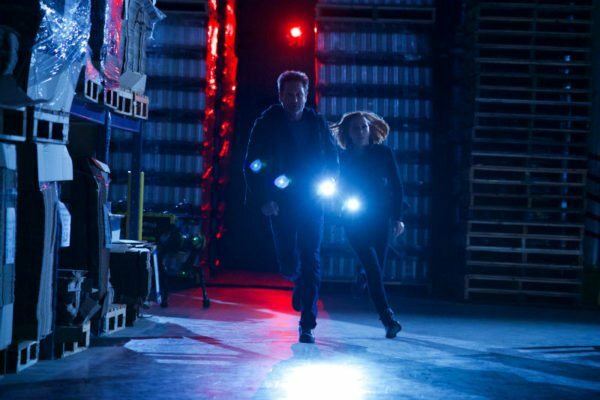 Unlike the demonic technology that bugs Mulder and Scully throughout, Rm9sbG93ZXJz is an episode that runs out of juice, not sure how to stretch its gimmick beyond another warehouse, corridor, and torchlight finale. 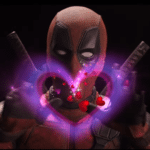 However, it still remains incredibly sprightly entertainment, successfully juggling smarts with smirks, and is made all the more impressive by the fact that the creative team are still willing to play with the formula this late in the run.